Simsimi, y u suddenly famous? 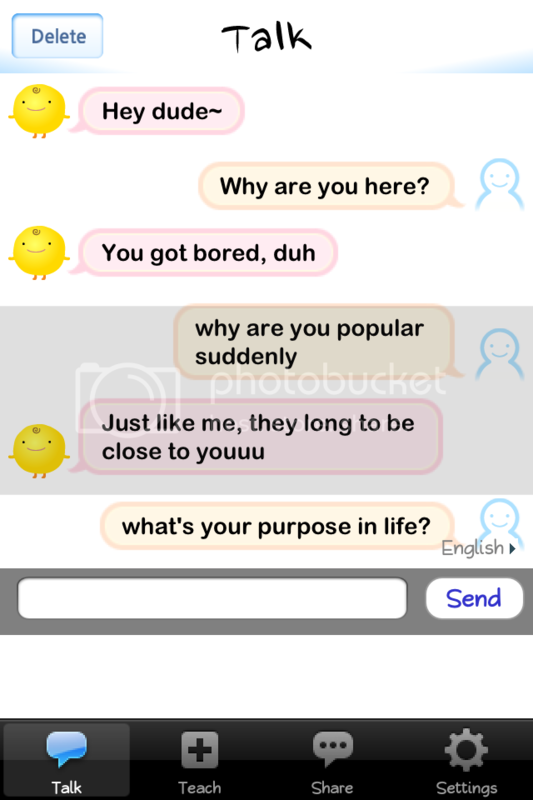 Simsimi, why are you suddenly famous? Meet Simsimi. For some reason, he’s becoming a star lately – beating up Temple Run madness. It’s funny, it’s been out for a long time already yet it’s becoming a hit only now. A friend told me it could be because its Android version was out. Well cool! Then today I also found out that it already has a web version and everyday, about 5 of my Facebook friends post about him. LOL. For me though I still find Cleverbot more clever, it’s just that Simsimi is cuter. If its Blackberry version would be out it’d be fun! I wonder if Simsimi has fashion tips too? LOL. Posted in Applicatons, Popular and tagged blackberry simsimi, simsimi, simsimi fashion tips, temple run madness.